With 55,000 psi under your eye, stout lockup, flawless steel and perfect headspace matter. When a primer spits fire into the powder charge and burning commences, gases form, increasing pressure inside the case and (because pressure produces heat), accelerating the burn. On a bullet ballistics graph, you’ll see a pressure peak after a short horizontal line showing the delay between primer detonation and powder ignition. After that peak, which typically happens within a millisecond (1/1,000 second) after the powder starts to burn, the pressure curve arcs back down. This decline is relatively gradual as the bullet moves forward, increasing the bore volume behind it. The faster the powder, the steeper the curve on both sides. The area under this pressure/time curve translates to bullet velocity. Two to three milliseconds after the striker hits the primer, pressure has dropped to zero. The bullet is on its way. A 180-grain bullet from a .300 Weatherby Magnum exits the muzzle of a 26-inch barrel about 1 1/4 milliseconds after it starts to move. The following bullet ballistics chart shows what happens (data adapted from a pressure/time curve in the excellent text Any Shot You Want, a loading manual by Art Alphin’s A-Square company). Surgeon rifles start as solid steel billets. Receivers easily endure 60,000-psi – and more. A few things to note: First, peak pressure comes when the bullet has moved only about 3 inches, even with the slow-burning fuels appropriate for a .300 magnum. Pressure drops off fast, too, losing 90 percent of its vigor in the next 18 inches of barrel. But the bullet continues to accelerate even as pressure behind it diminishes. Between 14 and 21 inches, pressure loss totals 18,000 psi. But bullet speed increases 300 fps! With very little pressure remaining at the muzzle, the bullet is still accelerating! The value of a long barrel is clear, even if nearly all of it is used to control the tail of the pressure/time curve. A pressure/distance curve differs from a pressure/time curve in slope, but it has the same general shape: steeper at the start than at the finish. The area under a pressure/distance curve represents the energy available for the bullet. However, the energy generated is not all available downrange. A lot of it is lost in thermal (heat) transmission, expansion of the case into the chamber wall, bullet/rifling friction and bullet rotation. Plotting a load’s pressure/distance curve helps designers of gas-driven autoloading rifles because these rifles must tap the gas at some point in the bullet’s travel. Too much pressure, and the slamming can damage rifle parts. Too little, and bolt travel is insufficient to clear the fired case. Thin barrel walls and lightweight receivers make lively shotguns. Pressures are modest. Measuring gas pressure proved as difficult at first as measuring bullet velocity. Then, in the mid-1800s, Alfred Nobel and an American named Rodman came up with solutions to that problem at the same time. Rodman’s, the crusher system, is still in use. Cases of rimfire ammunition are thin, limiting pressures. Rifle lock-up: One lug is enough. It’s a factory procedure not easily or safely performed in a home shop. A small cylindrical piston is slid into a hole in the barrel of a test gun, and a copper or lead pellet is inserted snugly between the top of the piston and a stationary anvil. When the rifle is fired, the piston pushes against the pellet or crusher, shortening it. The difference in crusher length before and after firing is then converted mathematically to a pressure range, in units of CUP or LUP (copper units of pressure or lead units of pressure). Copper crushers are generally either .146 in diameter and .400 long to start with, or .225 in diameter and .500 long. Choice depends on application. Copper crushers work best in centerfire rifles and handguns that generate substantial pressures. Lead crushers (.325 x .500) typically register the low-pressure loads in rimfire guns and shotguns (though small-diameter copper crushers can be used too). Crushers are calibrated in a test press. Pounded by high pressures, crushers don’t register peak pressure accurately because the flow of copper is slower than the change of pressure in the chamber. Also, the moving piston must be brought to a halt, which skews a reading in the opposite direction. Copper units of pressure (CUP) and lead units of pressure are not the same; nor can they be interchanged with another common unit of pressure, pounds per square inch (PSI). A CUP value may coincide with a PSI value; for example, SAAMI lists 28,000 as maximum average pressure for the .45-70. Both CUP and PSI units apply. But maximum average pressure for the .243 is 52,000 CUP and 60,000 PSI. Most cartridges show similar discrepancies. Sadly, there’s no easy way to convert CUP to PSI or vice versa. Conformal transducers are installed in the barrel, just like crusher pistons, and become part of the barrel. External transducers can be mounted on the barrel, then removed for replacement or calibration checks. Another pressure tester that’s become popular among shooters is the strain gauge. Developed for consumers by chronograph guru Ken Oehler, it’s essentially a length of wire you glue to the outside of the chamber wall. When you fire, the chamber expands and the wire stretches. That stretch translates into pressure. It does not equate with readings from a crusher or a piezoelectric gauge. Did you enjoy this blog post? Now is your chance to own Wayne van Zwoll’s entire article series — The Technical Rifleman. 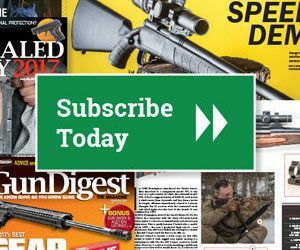 The entertaining and informative blog ran for a year on GunDigest.com, but was a lifetime in the making. The articles tap into the renown gun writer’s limitless knowledge of rifles and shooting, covering a wide range of topics, from picking the right rifle scope to figuring out a gun’s recoil. The Technical Rifleman is certain to round out any rifle enthusiast’s library. Pick up yours today! Buy the Kindle version of The Technical Rifleman here! I am still “breaking in ” my Dakota (African) 76 chambered in H&H .400 magnum. I experienced a cracked shell and am in process of having the loader examine the brass to see if we have a pressure problem or a bad piece of brass. Ever since I was sold this rifle chambered in the H&H .400 I wanted to ask your opinion of this Wildcat cartridge. I also have been advised to hunt dangerous game ( I plan to take it to Africa for Cape Buffalo) with the Swifts as the Woodleighs may not like the velocity of tis round. I love the rifle and the feel so far. Bottom line? What is your opinion of my decision to go with the shorter action and .400 H&H vs. the more traditional choice of , say .416 Rigby. The article on .223 vs 5.56 is GREAT! Is there a similar issue with .308 vs 7.62 in military arms? I shoot an FN FAL-LAR, semi-auto, Belgium made from Gun South. I would like to see a note or similar article on the issues.